Image: L-R: Sean Wilson, Gregg Cochrane, Andrew McLachlan, Liam McEvoy. 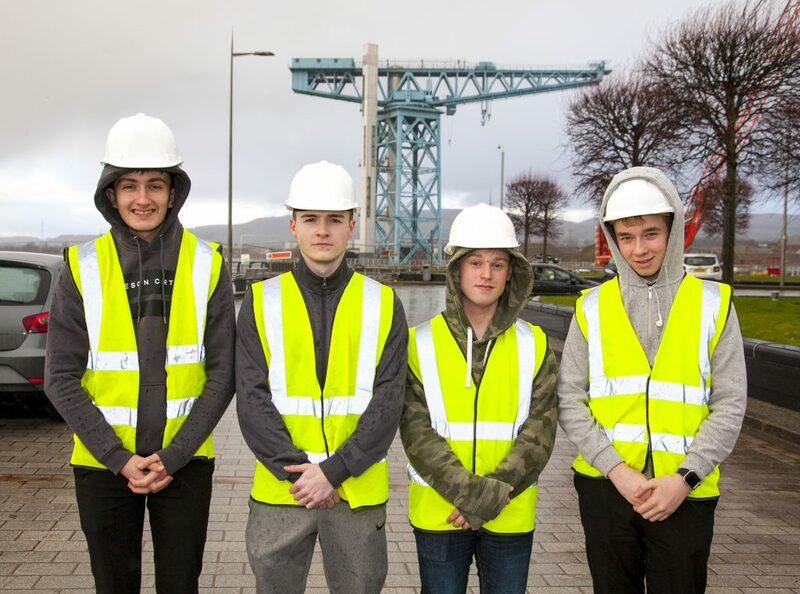 Six West Dunbartonshire school pupils are gaining on-site work experience at Queens Quay, the £250million regeneration project on the site of the former John Brown’s shipyard in Clydebank, as part of their Foundation Apprenticeships. Available to senior phase school pupils, Skills Development Scotland developed Foundation Apprenticeships in partnership with education and industry, with support from the European Social Fund. Typically taking two years to complete, Foundation Apprenticeships are taken alongside other subjects and lead to a qualification at the same level as a Higher (SCQF Level 6). Pupils spend part of the school week out of the classroom with a learning provider and in a workplace. The students gaining work-based learning at Queens Quay are taking Foundation Apprenticeships in Civil Engineering with West College Scotland. Working with I & H Brown, Muir Construction & George Leslie Ltd. at Queens Quay, the West College Scotland students are gaining valuable first-hand experience of what the role of a civil engineer entails, on-site and in the office. The work-based learning includes involvement in many aspects of the works currently ongoing within Queens Quay, including the marine, road and piping works. On-site learning for the apprenticeship began in September 2018 and, for this cohort, will conclude in April. On successful completion of the two-year apprenticeship the students can then use their qualification to explore progression into a number of other pathways, including a job such as a Modern or Graduate Apprenticeship, or moving on to study at college or university. Four of the students attend St Peter the Apostle High School. Sean Wilson (17), Paul Martin (17) and Jack Hepburn (17) are working on-site with I&H Brown, and Liam McEvoy (17) is working with Muir Construction. Gregg Cochrane (17) and Andrew McLachlan (18) are both students from Clydebank High School and are working with I&H Brown and George Leslie Ltd. respectively. The Clydebank project is led by Andrew McCall, West College Scotland’s foundation and apprenticeship employer engagement coordinator. “It’s fantastic to have the Queens Quay development right on our doorstep”, he said. “It’s opening up so many opportunities for the local community and for students who have their sights set on careers within the construction and engineering sectors.